There’s something rather poetic in the way James Hyde paints bands of color over a digital print (Down for Up, 2011), almost as if he were exposing the landscape as an illusion while at the same time validating the corporeality of rainbows. Similar bands can be found zigzagging through a terrain of wood and paper (Rotational, 2006), or weaving thermal patterns on a wall (Climate, 2002), thus bringing together the topographical elements evident in Hyde’s work, while simultaneously revealing a somewhat Barthesian concern behind the notions of reality and fantasy that govern his process. James Hyde, “DOWN FOR UP,” 2011. Acrylic on archival inkjet print on stretched linen, 87 x 70″. Courtesy of the artist, Sean Horton Gallery and Galerie Les Filles du Calvaire. Photo by Brian Buckley. “I’ve come to think about the camera as a third studio for me, so when I travel, I really like having a camera around because I don’t have a regular place to go and make work, and the camera is like this little room of imagination where I can invite the world in,” Hyde revealed in an interview in Gorky’s Granddaughter in April 2013. He was talking about his visit to L.A., and how he couldn’t understand the energy of a space until he went up to the mountains, where he finally found perspective. This desire for clarity is what drives Hyde to relentlessly pursue ways in which his images can be re-imagined through an exchange between the pictorial and the material, or what can also be referred to as a dialogue between the representational and the real. Hyde’s works offer an endless renegotiation between his own memories and the representations of a memory. 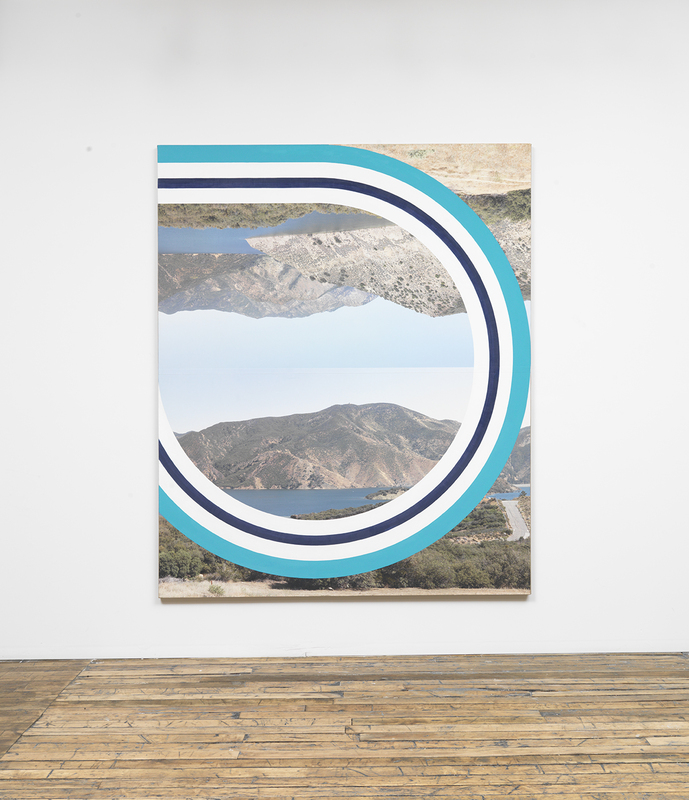 In this “game of artifice and artifact,” as Christine Buci-Glucksmann referred to Hyde’s work in her essay “Places of Painting,” he draws together several references to create a work which addresses the topological deformations of a given space—be it by flipping mountains upside-down, or manufacturing a landscape out of tens (sometimes hundreds) of digital images put together to create a seamless panoramic image—and therefore raises questions regarding its veracity. Each work is simultaneously a reference to a subject as well as a contradiction or negation of it, whether it be a glass box holding objects, an object made out of a ribbon of color, or a stretch of canvas with great sweeps of acrylic paint sectioning off parts of a digitally painted landscape. The location of fact in these loaded narratives is very important to Hyde. So is the definition of context, and how it differs from person to person while looking at an image, which is when his work enters Roland Barthes’s world of punctum and studium; the latter being a place where Hyde invites people to enter his “third studio […] of imagination,” while the former remains very much a private experience for Hyde as well as for those who encounter their own personal moments in the artist’s representation of a personal moment. What ties these moments together is a quality found in the work itself: a kind of a testimonial to a moment in time, captured with an honesty which translates into the work. Hyde’s work exhibits this kind of sincerity, a near-accurate representation of a moment in time, which invites a viewer to pay attention to the foresaid moment…a wondrous coalition of fact and fiction, reality and fantasy, nylon and rainbow.